She is Lovely: She is Lovely + Walking in Memphis in High Heels Giveaway!! 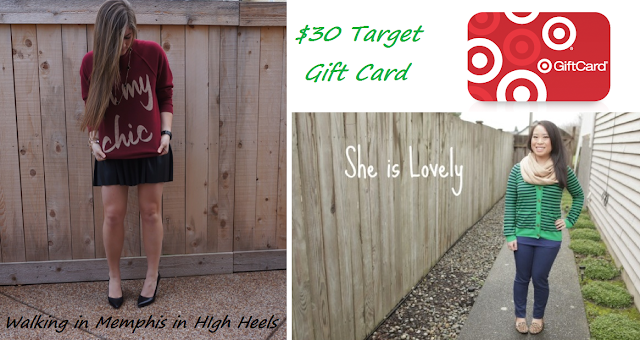 She is Lovely + Walking in Memphis in High Heels Giveaway!! So two things going on right now..
Second, I have another exciting giveaway starting today partnering up with Walking in Memphis in High Heels. Laura is such a sweet blogger and I've gotten to know her in the past few weeks (via the lovely social network) and she's genuinely awesome! This girl not only talks about fashion but she also does fitness, food, and home posts too! Definitely a blog worth checking out! I mean it.. click (Here)! Lately I've been going to Target and have been eyeing on (this), (this), and (this) each time. The wedge sneakers are something I've never thought I would like but after trying them on.. they are pretty comfy! And the leopard flats... uhh yeah! With subtle stud details on the back too?? Want it! The rules are simple as always. The winner will have 48 hours to reply back to the e-mail with shipping info once it has been announced. If not, we will pick another winner. I would use the gift card towards a mini bathroom makeover. I'd put it toward new Spring clothes! Haha yeah that is so true, you always find things at Target! I have the leopard flats that you've been eying and I love them! They're surprisingly comfy for being $20 flats. Great giveaway! what a fun giveaway! 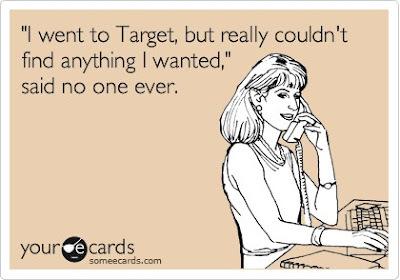 seriously, who doesn't love target! Those leopard flats with studded heels are definitely on my watch list! So cute! I'm in need of a new purse. The one I have, I SWEAR, attaches itself to every piece of lint, dog & cat hair in my house! It's so sad. Haha, love that e-card about Target. The clearance section gets me every time! Aww yay what a great giveaway! I can always do with something from Target. I would love to use the gift card for a pair of new shoes! I would buy a new spring dress, flowery! Thank you. I am a bit curious about fashion. I would dress me up with decent outfits. I wait for you for A DETOX POST!! I foolow you that i follow me! Hiii! Thanks for the giveaways!!!!!!!!! I LOVE Target! I saw a sick pair of heels yesterday! I would love to spend the gift card on a dress for spring/summer. I am a curious about fashion. I would dress me up with decent outfits. New clothes! it always give me a fresh feelings. I want to keep me update with fashion . And i want to dress me up with different adornment . I like fashion . Nhận cung ứng dịch vụ sắp đặt xây dựng noi that van phong , noi that nha bep , noi that phong ngu , noi that phong khach . Với mỗi khoảng không khác nhau đề nghị chủ căn nhà biết cách sắp xếp cũng như lựa sắm đồ đồ dùng trong nhà thích hợp nhu cầu đảm bảo ham mê chức năng, tiện dụng tốt nhất. Quý người mua có thể tham khảo thêm một số dịch vụ tại website do go noi that của cửa hàng. Chúng tôi nhận gia cong sat , gia cong sofa , gia cong san xuat do go , gia cong san xuat noi that với mức giá tốt nhất thị trường.